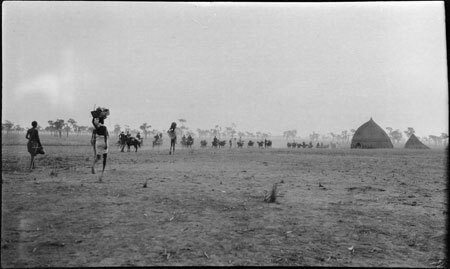 A line of mounted soldiers making its way past a Nuer settlement, with a large luak or cattle byre visible to the right, with arching posts either side of the entrance that mimick spreading cattle horns. Morton, Chris. "Patrol in Nuerland" Southern Sudan Project (in development). 03 Jan. 2006. Pitt Rivers Museum. <http://southernsudan.prm.ox.ac.uk/details/1998.204.5.80/>.